Saiz pralihat ini: 800 × 600 piksel. Leraian-leraian lain: 320 × 240 piksel | 640 × 480 piksel | 1,024 × 768 piksel | 1,280 × 959 piksel | 3,139 × 2,353 piksel. 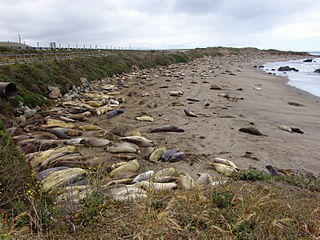 English: Elephant seals (Mirounga angustirostris) mating on a beach near San Simeon, California, USA. April 21, 2007. Licensed under the CC-By-SA-3.0. You are free to share - to copy, distribute and transmit the work. You must attribute the work: link back to freefoto.ca and attribution required.